Here are seven great Netflix TV shows that are safe for the whole family to watch. I realize that this is old but some things never go out of date like sheriff Andy Taylor (Andy Griffith) teaching his son (Opie) to take responsibility in life, to do as he is told, to show respect for his elders, and that we can use very expressive language without resorting to foul language. Mayberry is the consummate small town in America…at least it used to be. This TV show has the highest Netflix Stare rating they can give at a five! I am prejudiced because I love the show but apparently, I’m not alone in this. These are really interesting but the language is clean and there are no sexual innuendos or sexually suggestive content…but that could be said with all of these shows I ‘m covering here. I wanted to be as comfortable in sitting down with my grandchildren to watch these television shows, just as I would not feel troubled if Jesus were watching with us…and by the way, He is. The TV show is action-oriented and is never going to bore anyone who watches it, young or old. Plus it’s suitable for the entire family. Curious George, a very inquisitive and curious African monkey is always getting in trouble and this same television show is based upon the book by H. A. Ray which features the Man in the Yellow Hat who always manages to save the day from another catastrophe that George created. These television shows have so many funny spots that it’s hard to imagine the whole family not enjoying and laughing out loud, plus the TV show have several lessons about responsibility and consequences for not doing what they’re told. Yes, it’s a very dated TV show but so is Beethoven’s Fifth Symphony and is still an all-time classic and Curious George comes with Netflix’s highest rating for televisions shows (5). This television show is still in syndication so you might see it occasionally and there is never any chance that “Beaver” or his brother, “Wally,” will ever do something that they won’t pay for later. More often it’s Beaver that gets into a jam and can’t seem to find his way out, but they both learn lessons the hard way. A few times, their father actually lets them get the consequence from their actions in order to teach them a valuable lesson about life. Rules and laws are meant to help us, not harm us, and when we break them, they can break us. Beaver is no exception. The television series, All Creatures Great and Small is based on the books of British veterinarian, Alf Wight, who also happens to be an animal surgeon, so the series is based upon an author who obviously cares for all animals, big and small. That’s an important lesson for children and adults to learn because the Bible teaches that “Whoever is righteous has regard for the life of his beast, but the mercy of the wicked is cruel” (Prov 12:10) so this television serious reminds children that God is the Creator of Life and we should respect all life, therefore this television serious can teach children about how we should treat animals and by extension, treat everyone else. Almost everyone that’s an adult over or near age 60 can identify with Kevin Arnold, who is often placed in very awkward positions and often in the view of others. This television serious was placed in a time in American history that was very turbulent and this series attempted to American’s faith back into the family. Kevin’s journey through adolescence to adult hood during the late 60’s and early 70’s was told through a series of flashbacks and these almost always had a life lesson in each episode. The content and language is suitable for the whole family. This television series features a father (Bod Saget) who is truly conservative and tries to keep his family from growing up too fast and also features John Stamos, Dave Coulier, and the Olsen twins, Ashley and Mary-Kate. It is adorable and you would never have to hesitate to watch any episode as there are no problems that dad can’t fix. The setting was just after the sudden death of his wife where Danny Tanner (Bob Saget) enlists the help of his brother-in-law Jesse and his friend Joey to help him raise his three daughters, D.J., Stephanie and Michelle. The way these three men “work together” is enough to keep you laughing throughout the entire show. The content and language sparkling clean and there’s never a need to hit the mute button. There is nothing better than the family sitting down to a great television series that all the family can watch. Humor doesn’t have to be dirty, shows don’t have to have bad language, or programs don’t need to be sexually explicit to be interesting. Good, clean fun is still fun. 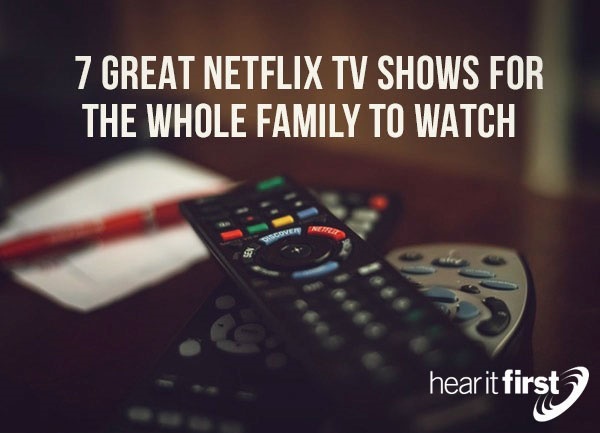 Why not make a “Family Night” for Netflix TV shows and, while you’re at it, make some popcorn.